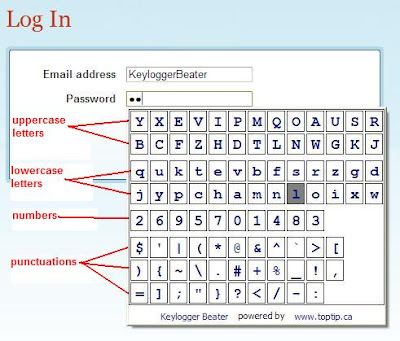 To know the basic usage and features of Keylogger Beater, please read this post first. 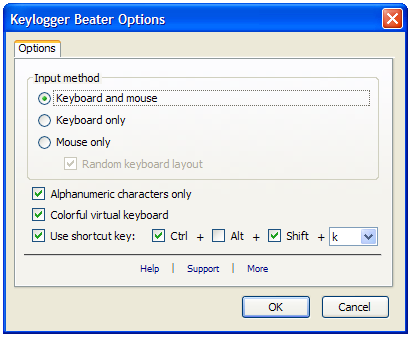 Besides Ctrl-Shift-k, you can also activate Keylogger Beater via the context menu. 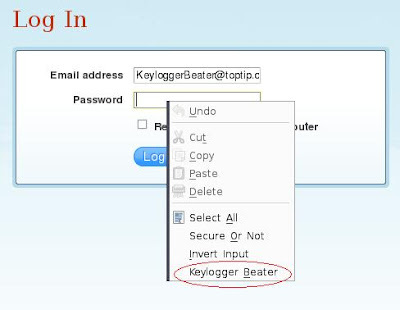 Right click on a text area or a password box and you can find a new menu item "Keylogger Beater". Click on it to turn on the Virtual Keyboard and start your private input. If it is selected, you can use both the keyboard and mouse on the Virtual Keyboard to input characters. If it is selected, you can hit the Shadow Key to input the Real Key. Hovering the mouse over the Virtual Keyboard will have no effect. If it is selected, the "Shadow Key to Real Key" mapping function is disable. 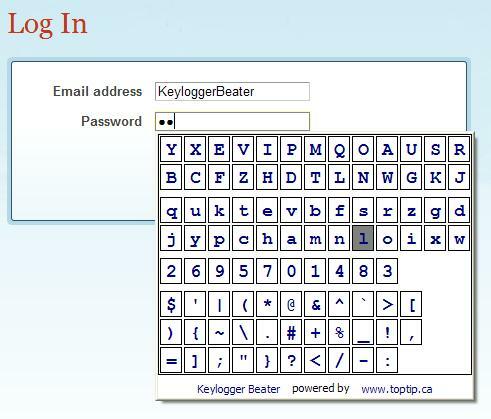 That means you should only use the mouse on the Virtual Keyboard, because whatever you hit on the physical keyboard will be entered into the browser intact -- they can be captured by a keylogger. And the Virtual Keyboard will only show the Real Keys because there would be no Shadow Keys. The Virtual Keyboard will be in black and white. If you use the computer at home and do not worry about peeking over the shoulder, you can use only the mouse with the Virtual Keyboard. Turning the "Use keyboard to input" option off gives you a clean Virtual Keyboard. When you use the mouse only input method, you can enable the this option to use a random layout. This adds one more secure level to the input method. It is not totally random, the keys are grouped by uppercase letters, lowercase letters, numbers and punctuations to make them easy to find. By default, this option is off. Some people may find that the Virtual Keyboard have too many keys, and it is difficult to find a specific punctuation key because they are in no official order. You can check this option to make the Virtual Keyboard contains alphanumeric characters only. That does not mean you can not input a punctuation mark. It just means a punctuation will be input directly from the physical keyboard to the browser without being encoded/decoded by the Virtual Keyboard. 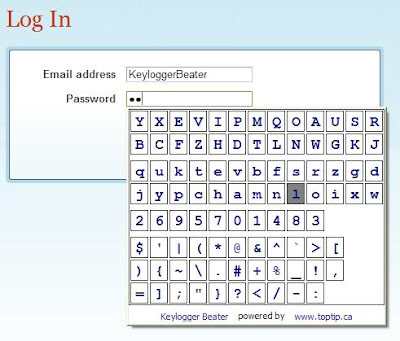 It is less secure because a keylogger can capture it. By default, this option is on. The color of a key in the Virtual Keyboard is determined by the Shadow Key. If a Shadow Key is an uppercase letter, the color is green; if lowercase, it is blue; if number, it is yellow; and if punctuation, it is red. If you uncheck this option, they are all in black and white. As we state in the earlier section, if you uncheck "Use keyboard to input", this option has no effect and the keys are all in black and white because there are no Shadow Keys. Check this option to enable shortcut key. You can choose your own shortcut key combination. 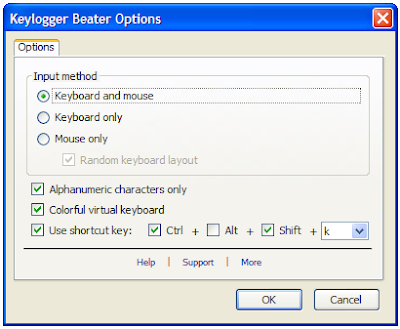 Each time you press the shortcut key of Keylogger Beater, the Virtual Keyboard will be re-arranged. 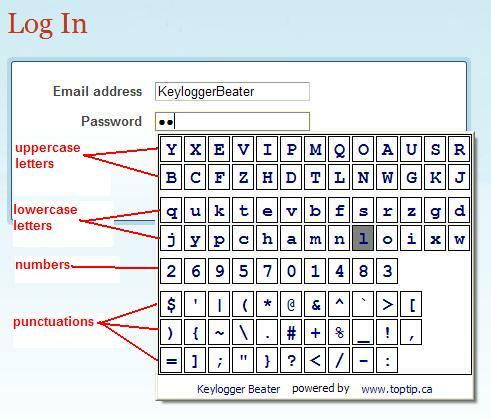 So you do not need to worry that a keylogger could steal the mapping rule of the Virtual Keyboard. Invert Input is another Firefox extension I wrote. You can install it if you want an extra layer of secure input. Here is how -- First input your password backwards with Keylogger Beater. Then use Invert Input to reverse it. In this case, even somebody use a camera to record your screen and keystrokes, they would not be able to break your account. Then, the second character (keyboard-char) needs not to be displayed, resulting in a real simple and immediately understandable user-interface (ABCD...). even with keyboard typing ON, the fist char should be large and the second (to be typed key) should be smaller. Makes it easier to see the ABCDE... structure and what the button will result in. 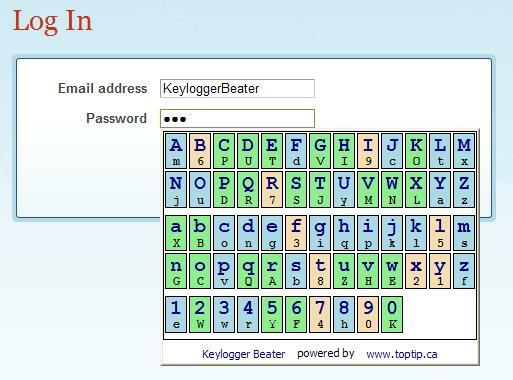 would be cool to have a reference to some other keylogger-chaser/detector software and poss. malware. Thanks for the useful comments. A new version 2.0 was submitted to addons.mozilla.org. (It may not be available right away.) The new version highlights the first char to make it easy to find. The online help was also updated. is this developed in java??? which is the language used to do so?? ?